“Rocky Top” is a newly furnished 1568 sq. ft. authentic log cabin located in Eagle Springs Resort minutes from Pigeon Forge. Adults and children will enjoy the Loft game room featuring a 46 “inch plasma T.V., PlayStation 4 with popular games, Video chairs and a reclining love seat offer plenty of room for the kids or adults to relax while playing games. The loft offers a Pool Table, board games, puzzles, and books! There is also access to a private balcony with chairs to relax and enjoy the peace and quiet of the Smoky Mountains! The entire family will love the great room with vaulted open beam ceilings and a new 55” wall mounted LED HDTV which includes premium cable and Blue Ray DVD player. “Rocky Top” comfortably accommodates up to six guests. The master bedroom has a king size bed complete with new bedding, 500 count Egyptian cotton sheets, mattress topper, and a new 32" HD flat-screen wall mounted TV, DVD player and access to Netflix, Hulu, or Roku. The 2nd bedroom has a queen size bed with all new bedding, high quality sheets, comfy mattress, and a new 32” flat-screen HD wall- mounted TV, DVD player and access to Netflix, Hulu, or Roku. Each bedroom offers a spacious full bath. The main living area has a brand new sleeper sofa, reclining love seat, recliner, and wood burning fireplace. Guests may choose to contact a local firewood provider for delivery of firewood for their stay or purchase small bundles at several grocery stores. The cabin has a wraparound porch offering rockers, a glider, and both a charcoal and gas grill! Enjoy meals in the completely stocked beautiful kitchen with all the needed appliances(including a Keurig) and utensils for meal preparation. The dining area has seating for up to 6. Laundry room offers a brand new front load stacked washer/dryer. The end of a perfect day includes a relaxing soak in the brand new 5 person hot tub located on the back deck. The privacy and scenery of the beautiful mountains will rejuvenate guests. 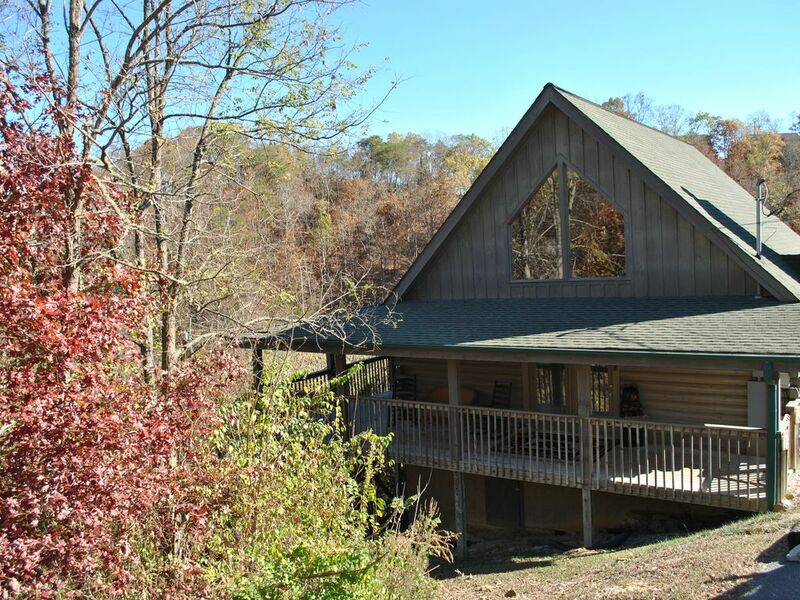 The cabin is located just 9 miles from Dolly Parton Parkway and offers several alternate ways to avoid traffic. Guests staying at the cabin have access to the resort pool and picnic pavilion. The paved roads and parking for 2 cars ensures ease of entry. Minimum 2 night stay, but owners are willing to negotiate with guests who are looking for a weekend getaway. Guests need to be 25 years or older unless other arrangements have been made with the owners. Another added bonus is a NO HASSLE CHECK IN; all information is sent directly to you, so you can drive straight from home to the cabin! The owners are eager to share their cabin with guests and will try their best to respond within 2 hours of being contacted. Our family fell in love with the beautiful Smoky Mountains after our first trip! The family friendly atmosphere is perfect for our adult children and grandchildren. There are activities within minutes of the cabin for all of us to enjoy! The hiking trails and views encourage our family to get out and enjoy the outdoors. The Eagle Springs Resort is a friendly, safe and very quiet community. We felt right at home. Everyone is helpful and eager to lend a hand. The main living area for the cabin is all on one level. During inclement weather the county maintains the roads. This cabin offers a mountain feel while being minutes from the main parkway, shows, attractions, golf, and shopping! The abundant wrap around porch offers plenty of room for your family to enjoy the views. Full size pool table with plenty of room to shoot pool! Mountain motif throughout the cabin! We look forward to sharing our cabin with you and your family! We love the area and know you will too! The property was beautiful and relaxing. The property was beautiful and clean. It was relaxing and quiet. Just what we needed to make our spring break a great one. Rocky Top was wonderful. The cabin was meticulously clean and beautifully decorated. The beds were comfortable the the kitchen was stocked beyond what I could expect. The game room was great for the kids and the hot tub was hot and ready to go. There was nothing we would change about the cabin and plan to return. It is about 10 minutes from Sevierville, which has plenty of restaurant choices, and 20 minutes from Pigeon Forge. The cabin is just beautiful! Everything was nice and clean! We ate out cause on the run but there was plenty in the kit to use if you wanted to eat in. It was very convenient to the convention center and all of the attractions. The owners are very nice and helpful. Thank you for letting us come a day early. We really appreciate it. Thank you so much for opening your home. I would really recommend this cabin. You will not be sorry!! Thanks and God Bless You!! Thank you so much for your kind words! We hope you will stay with us again !! We booked a weekend to celebrate our son’s 10th birthday and it was everything we hoped for! The cabin was cozy and quiet. We enjoyed the wood-burning fireplace and relaxing hot tub. Our son loved the pool table and PS4. The owners are great and responded promptly to any question we had before our visit. We would recommend this cabin and look forward to staying again in the future! Very clean affordable and just as advertised. All our questions were answered within minutes and the owners were very professional and friendly. Hope to stay again in the spring 10/10!